What happened with the Internet in 2008? We have used a wide variety of sources from around the Web. A full list of source references is available at the bottom of the post for those interested. In some of the cases we here at Pingdom also did some additional calculations to get even more numbers to play around with. 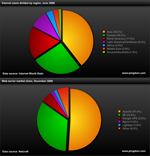 Data sources: Website and web server stats from Netcraft. Domain name stats from Verisign and Webhosting.info. 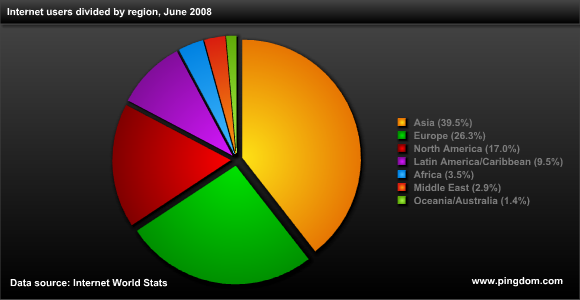 Internet user stats from Internet World Stats. 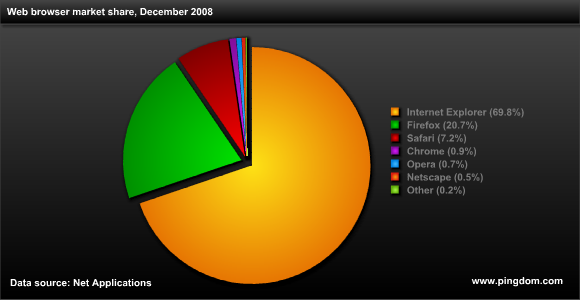 Web browser stats from Net Applications. 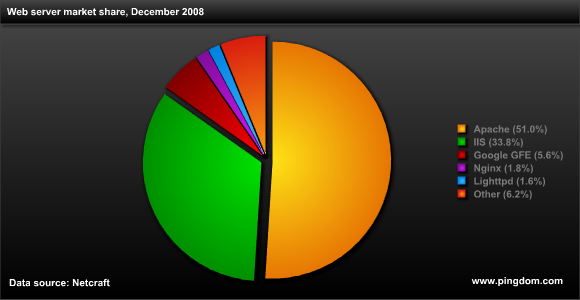 Blog stats from Technorati. Email stats from Radicati Group via About.com. Spam stats from DCC. Virus stats from Symantec via Times Online. Online video stats from Comscore. Photo stats from CNET and Flickr. Wow, that’s some big numbers. You can tell the Internet is growing to be a powerful force in the future. Excellent post! Great job pulling all this data together. Interesting that North America only has 17% of the world’s internet population. I had no idea. great info. wish to have per country statistics. anyway, thanks and appreciate the effort! These data are very interesting and usefull. I have a little question: When you said “Billion”, do you mean 1.000.000.000 (one million of millions) ?? or just 1000.000.000 (one thousand of millons). handy information great .. stumbled! 210 billion emails sent per day and 70% of it is spam, which means that 30% of 210 = 63 billion are genuine emails. I find it hard to believe that on an average an email user sends 48.61 emails every day. Might be a good idea to make sure your websites grow by at least 20-25% a year to keep pace! EU is not fully united yet so each “State” has its own market and fundings for “broadband broadening”. which leads to better availability, both in cities and on the countryside..
Alot of amazing statistics. Except the stats on malware make me sick. Not so much the absolute volume, but the growth rate. Sadly, the virus-writing community is becoming very sophisticated, in some cases dropping payloads that disable your A/V software before doing actual damage to your system, making them very powerful and hard to block. Even if your A/V software has the malware identified in its most recent virus definition file, it has no value unless the A/V background service is actually running.